Circulation of newspapers in Bulgaria decreased by more than 15 per cent in 2015, while the number of newspapers published also fell, the National Statistical Institute (NSI) said on June 20 2016. In an annual report on publishing in Bulgaria in 2015, the NSI said that last year, there were 283 newspapers being published in Bulgaria, more than half of them in Sofia. The number of newspapers published in Bulgaria was 12 less than in 2014, while combined circulation fell by 15.3 per cent, the NSI said. Of the newspapers, 51 were dailies, 18 came out two to three times a week, 124 were weeklies and 90 came out less than once a week. A total of 276 of the newspapers were in Bulgarian, and seven were in foreign languages. Three were in Turkish, two in Russian, one in English and one in German, according to the NSI. 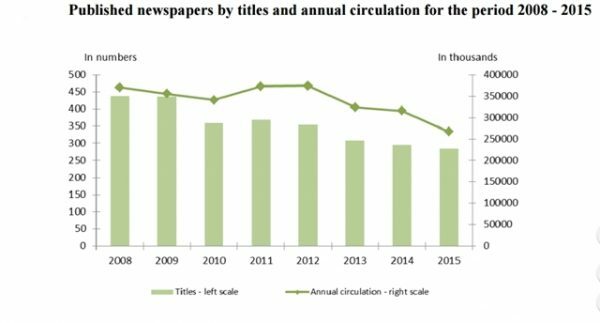 The NSI’s figures showed an overall decline in the number of newspapers published and in collective circulation since 2008. The NSI said that in 2015, a total of 8221 books were published in Bulgaria. Of these, 7677 had an ISBN code. The number of published books and pamphlets was 24 per cent (1805) higher than in 2014. Of the total, 3035 were classified as fiction for adults, “scientific literature” (though this usage could also cover, for instance, topics such as history and politics) 1859, educational literature 1614, popular literature 1521, children’s and juvenile literature 837 – including children’s fiction, 451 – and “other” 454. Of the books published in Bulgaria in 2015, a total of 6870 (73.7 per cent) were in Bulgarian. Of translated literature, close to 59 per cent was translated from English, about eight per cent from German, six per cent from Russian, and 5.5 per cent from French.